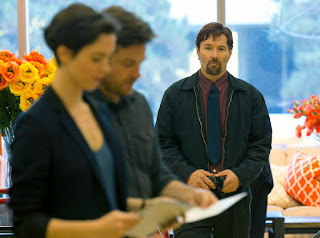 If you told me a month ago that “The Gift” the writing and directorial debut of Joel Edgerton would be one of the best thrillers of the year, I would have said you’re joking. And here we are and “The Gift” is a cinematic present indeed. It features terrifically nuanced performances from its cast and a twisty, tension-filled script that’s beautifully directed. I absolutely love films directed by actors. Sometimes they just get it. Actor-turned-directors get acting therefore know how to direct actors. Mr. Edgerton, known for appearances in Warrior, Exodus Gods and Kings, and The Great Gatsby pulls triple duty by also writing and acting. “The Gift” is a stylish thriller filled with sometimes unbearable tension and is note-worthy for featuring practically no onscreen violence. It’s pretty amazing and simply Hitchcockian in execution. The film stars Jason Bateman and Rebecca Hall as Simon and Robyn. They’re that typical thriller movie couple who move into a new house at the beginning of the film. It has lots of big open windows. Not an ideal place you want to live if a creepy man from your past insists on constantly stopping by and creepily leaving you welcome gifts. That creepy weirdo is Gordo and he’s played by Edgerton. Gordo runs into Simon at a store and welcomes him and his wife back to his hometown. They appear to be old friends though Simon doesn’t remember him right away. A one-sided friendship then develops as Gordo appears to practically stalk the couple until Simon has to intervene. These early scenes are the epitome of awkwardness. However, awkwardness soon turns to paranoia after Simon has to harshly end the “friendship” – as it appears something from these men’s past refuses to stay in the past. And that’s where things really start getting fun and creepy. The film is first and foremost a perfect showcase for superior acting skills. Hall and Bateman are great and as the script unveils more about their past their characters really develop and it comes through in their performances. Edgerton is master in the weirdo department, though not much is learned about him until the movie enters its final act. The screenplay is also incredibly tight and clever. It plays against most of the audience’s expectations. This is a genre we’ve seen before. I’ve heard comparisons from things like “One Hour Photo” to “Fatal Attraction” and other 90s stalker thrillers. And those feel like legitimate comparisons. Trailer for The Gift on TrailerAddict.